The FEI CryoS/TEM is the result of NSF MRI award (1429155) and is the first monochromated, high-resolution cryo-S/TEM. This instrument is capable of imaging inorganic and organic materials at the nanoscale. It is equipped with a Field Emission Gun (X-FEG), a monochromator, probe corrector and the availability of single and double tilt holders for room temperature and cryo work. The microscope is set up for data collection at 60, 120 and 300 kV providing resolutions of up to 0.08 nm. This revolutionary instrument allows for imaging of materials samples, such as batteries and how they degrade over time, and the study proteins and cellular components in native-like state at cryogenic temperatures. 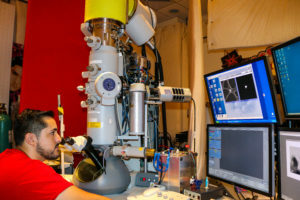 The cryoS/TEM bridges the fields of materials and biological sciences, providing a unique platform to conduct interdisciplinary (biology, engineering, chemistry and physics) research at atomic resolution. Samples ranging from rechargeable batteries, crystals, to isolated proteins and cells can be imaged seamlessly. Available modes for data acquisition range from single particle cryoEM, cryo tomography, Bright Field/Dark Field, EELS, STEM and Lorentz TEM and Low Dose imaging along with specialized holders necessary for preserving samples. The CryoS/TEM is equipped with a Gatan GIF Tridiem energy filter, for EELS and high resolution single particle applications, a cryo blades system for conducting data acquisition of materials and biological samples at liquid nitrogen temperatures, an FEI Ceta 16M camera and a Gatan EF-CCD. 2-week reservation window in Coral. One reservation during work hours (8AM to 5PM, M-F) permitted during the current 2-week window. Contact manager for any reservation exceptions. No reservation restrictions outside of work hours.